Have the lights stay in the same state even after the car is turned off (for example, if the lights were on when I shut the car off, I want them to turn on again the next time I start it). Because I use the foglights as DRLs here in Canada, I want them on whenever I'm driving during the day, without having to remember to turn them on every time I start the car. I'm happy to say that this method of rewiring checks all those boxes. Read on if you'd like your fogs to work like this too. - (Optional) Relay mount makes it easier to connect all your wiring to the new relay. The relay is the key to this; it converts a momentary switch like our OEM foglight switch into a latching-type switch. Even better with this one is that it also maintains its state after it loses power. This means that if you had your fog lights off when you turned your car off, they'll still be off the next time you start it. If you had them on when you stopped the car, they'll turn back on the next time you start it. Here's the wiring diagram, overlayed on top of the OEM wiring diagram (grayed-out parts won't be touched). - The 'B' pole just goes to a ground. There's a bolt very close by that you can use, just above the hole where the left screw of the dash trim goes. - The '9' pole goes all the way to the engine bay, to the OEM fog light relay (A-06X). See figures 4, 5 and 6 below, and afterwards for more on how I did the wiring in the engine bay. 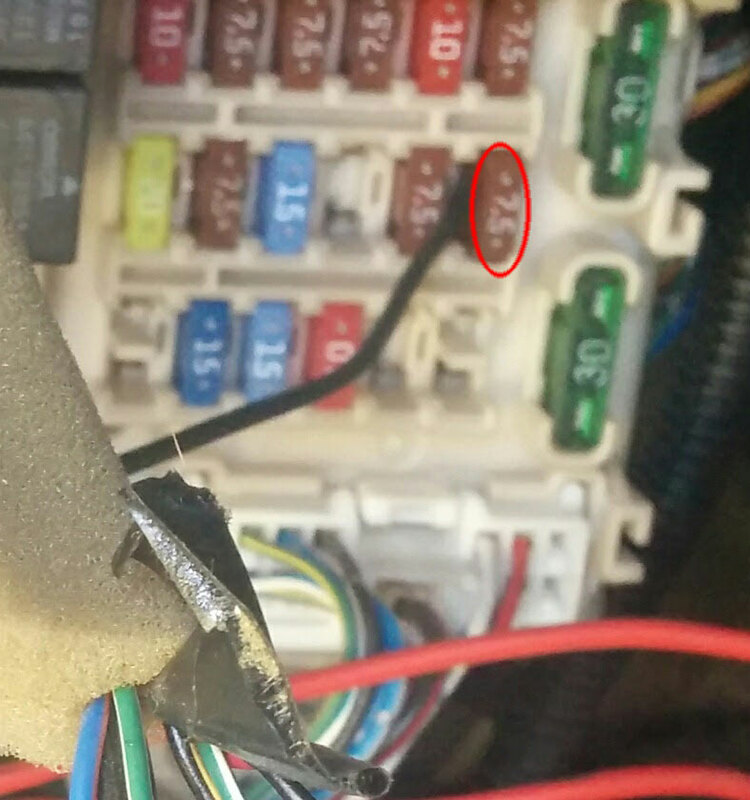 Figure 3, showing the fuse I used as a 12V power source. 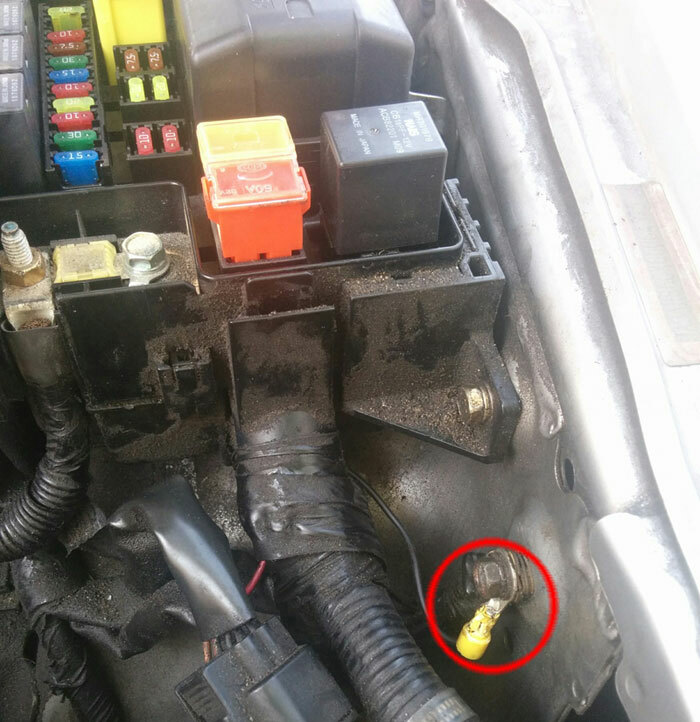 This fuse only gets power when the ignition is 'on' (not 'acc'). If for whatever reason you want to use the fogs with the key in 'acc' as well, you'll need a different fuse. This is in the fuse box under the steering wheel. To route the wire from the relay to the engine bay, I passed through a grommet above the clutch pedal assembly which leads to the fender. 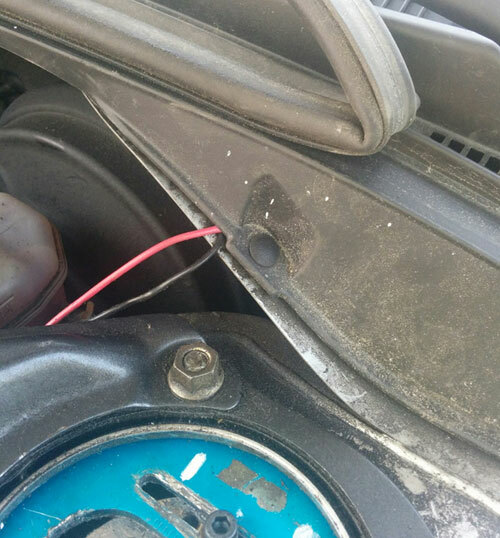 You'll likely need to turn the steering wheel in order to be able to squeeze your hand in behind the fender liner to get the wire and route it to the engine bay. 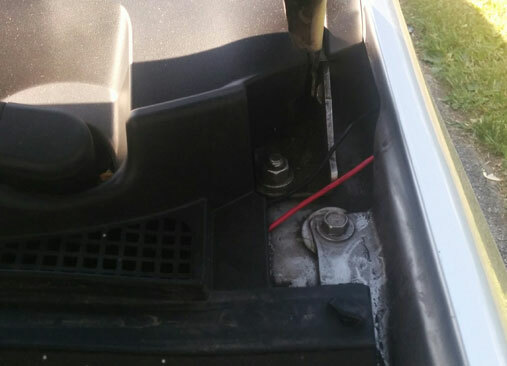 Figures 4 and 5, showing where I routed the wire from the cabin to the engine bay. Figure 6, showing the fog light relay in the engine bay junction box. Just two things need to be done in the engine bay. 1. Pin 3 on the fog light relay needs to be grounded. Figure 8 below shows where I grounded it. 2. Pin 2 is where the wire coming from the cabin goes. - Remove the 2 10mm bolts securing the relay boxes in place. One is barely visible in the bottom left corner of figure 6, and the other is at the opposite corner. - Now, the skinny relay box needs to be removed before being able to get to the big one. On each long side of the skinny relay box, there are 3 small tabs in which you can stick a flat screwdriver to be able to separate it from the base of the relay box. You'll only be able to access 5, but this will be enough to partially separate the base from the box. You now need to release the 2 bigger tabs holding the small box to the big one, and you'll be able to start sliding the skinny box upwards. On my car the wires under the small box going into it had very little give in them; this is why the base needs to be separated; in order to allow the rest of the box to slide out from the clips holding it to the big one. As you slide the box out, you should be able to release the last small tab to completely separate it from the base, which will give you more leeway to get it out. - With the small relay box separated from the big one, you can now reach the small tabs all around the big relay box that are holding the base in. When all tabs are released, you can tilt the relay box forward to see the horrible/wonderful jumble of wires underneath it. Refer to figure 7 below for the pinout of the fog light relay. As a reminder, the relay we need is A-06X, and the wires that need to be cut to be spliced elsewhere are 2 and 3. When you cut, make sure to leave yourself a long enough wire coming out of the base of the relay box to be able to strip the end and splice it into the wire from the cabin (for pin 2) or an extension to be able to ground it (pin 3). 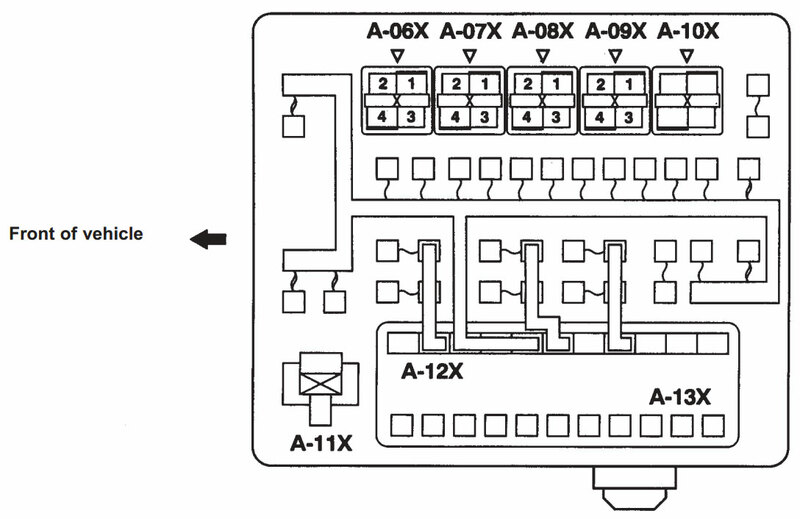 Figure 7, showing the pinout for the relay box. 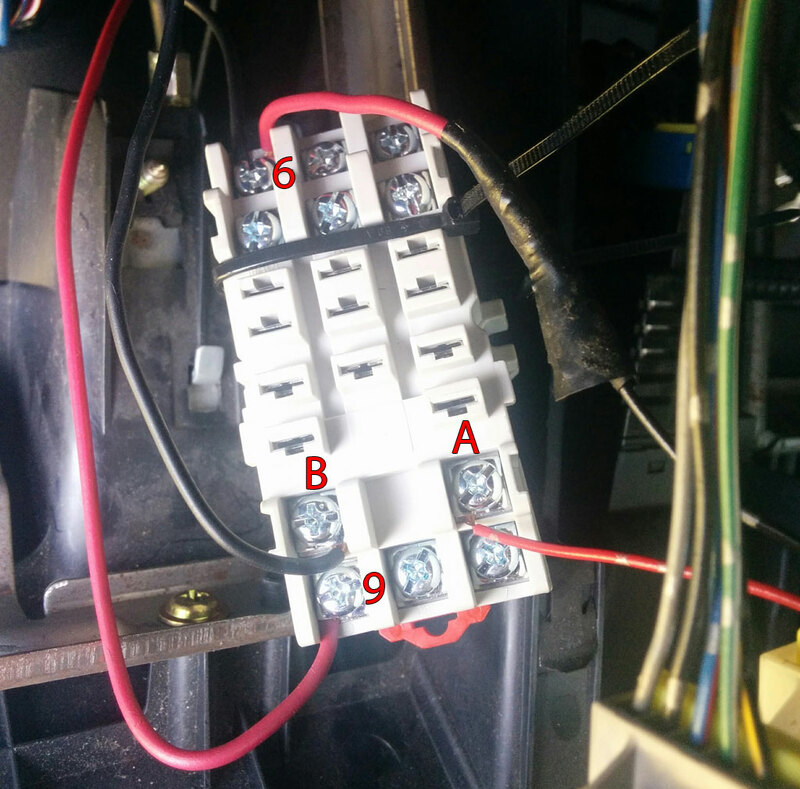 Figure 8, showing where I grounded pin 3 of the fog light relay. With that done, you should be done! Enjoy! If I have my headlights on I have my fog lights on. So, for me, there's no point in having two switches. Good write up. I need my foglights as DRL's here in Canada, so that's why I needed to be able to have my foglights on whenever I wanted. Thanks for the write up! This is something I been wanting to do,I did this to my e30. Do you have any pics of just the fogs on without the lows on? I can get some, what kind of pic do you want? To see how much light they put out when it's dark compared to the lows? Actually just day time pics from the other outside with just the fogs on. Ah, got plenty of those! Nice work, been waiting for years for a simple solution to this issue for the VIII/IX..Thx. Bump...I'm trying to wire my fogs and follow this exact setup. Unfortunately, the relay you have listed is discontinued. Do you have any other types of relays you could recommend? I'm not too good with electronics. Thanks! Very unfortunate that it's discontinued, as it took me a while to find that part. I did a quick search but didn't find any suitable replacements yet. 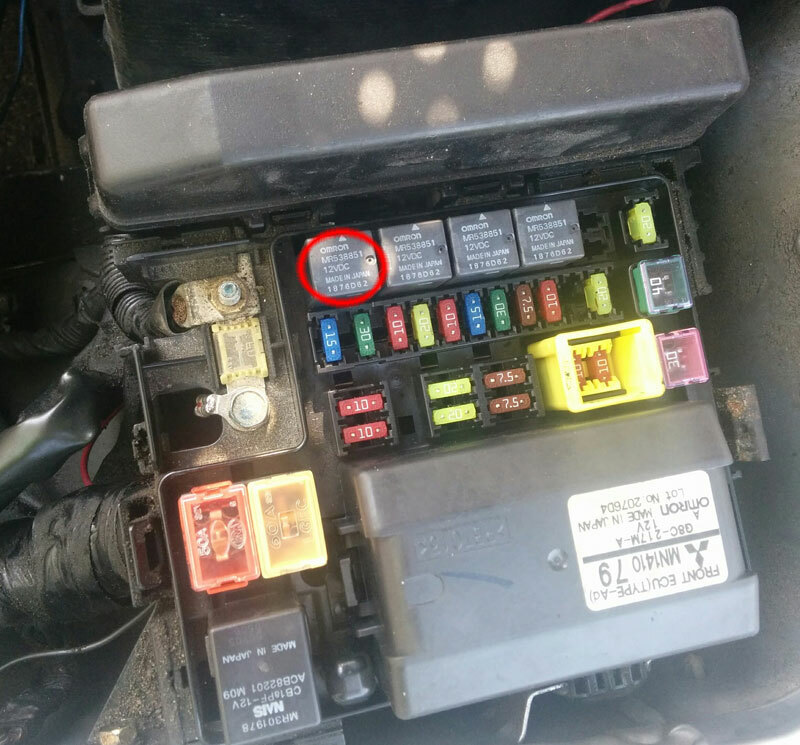 Basically you should look for an impulse latching relay, ideally that also uses permanent magnet latching so that it remembers its position when you turn the car off. 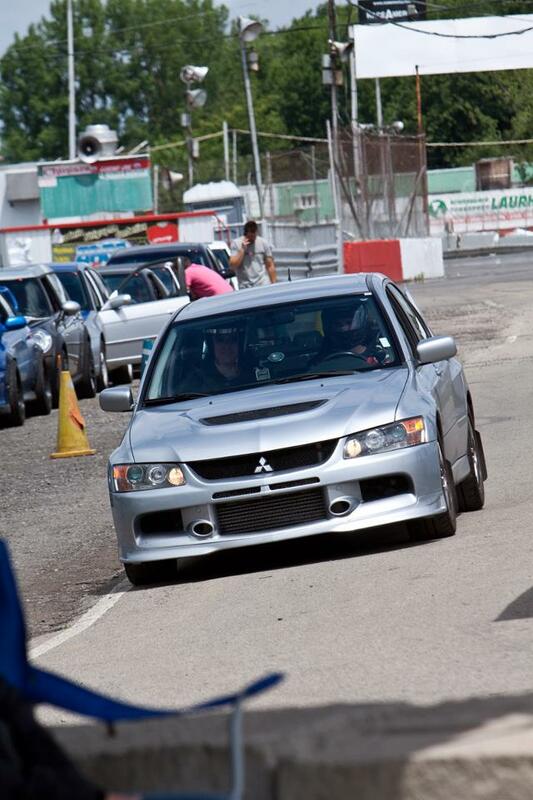 How to: Make a non foglight evo to a foglight evo?